An innovative tool that helps journalists search for news content on social media has been given a top accolade by the European Commission. 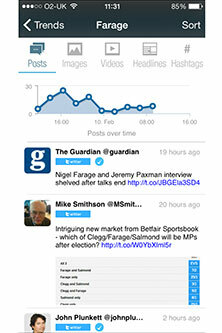 SocialSensor is currently available as a free iPhone app, as well a more elaborate web-based version for news organisations. It has already been used to successfully predict the outcome of the Greek election and will now be applied to the UK general election in May. The unique feature of the tool is that it allows journalists to access to a variety of social media content, including pictures and video, across all major social media platforms. It has also been developed to help verify trusted sources and highlight the most relevant content. A team from City University London's Department of Journalism played a key role a three-year project to develop the software, which was created as part of a wider EU-funded scheme. The development process - made possible by a €10 million grant divided between 12 collaborating organisations - brought together computer scientists from leading institutions such as IBM, Yahoo! and Alcatel-Lucent Bell Labs, as well as social scientists and journalists. 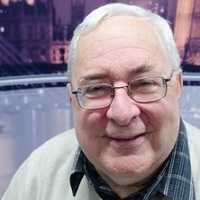 Principal Investigator Steve Schifferes, Professor of Financial Journalism at City University, said: "Social media is increasingly central to what journalists do. These networks are the main source of news for young people, so it is essential that journalists search these channels for content. "The tool should help journalists make more effective use of the rich resources in social media to spot trends, follow developing stories and find new content. This is a critical area for journalism and we believe that with SocialSensor we have made a significant contribution. "I pay tribute to the outstanding collaborative work between computer science teams across Europe and journalists at City and Deutsche Welle, the German public broadcaster, which ensured the rapid and successful roll-out of this device." The development of the journalism tool was one half of a wider project involving 12 organisations from across Europe, with teams also using the technology to create a system for analysing social media content relating to entertainment events. The project was reviewed by the European Commission at the end of January, with the body awarding the scheme its top grade of "excellent progress". City's team played the key role of specifying what type of system was needed, driving its development and evaluating the effectiveness of the tools. Professor Schifferes and his colleagues are now exploring opportunities to market the software to news organisations around the world. To download the SocialSensor app and for more information, visit www.socialsensor.eu. The 12 partner organisations are: Centre for Research and Technology Hellas (Greece), University of Koblenz-Landau (Germany), Alcatel-Lucent Bell Labs (France), Yahoo! (Spain), City University London, Athens Technology Centre (Greece), Deutsche Welle (Germany), German Research Center for Artificial Intelligence GmbH (Germany), IBM (Israel), University of Klagenfurt (Austria), JCP-Connect (France) and Robert Gordon University (UK). The information sciences team at Robert Gordon University was originally based at City when the project began. The project has received funding from the European Union's Seventh Framework Programme for research, technological development and demonstration under grant agreement no 287975. The research took place over three years from October 2011 to November 2014.